The Dean (Research), College of Humanities, Arts and Social Sciences is an active research leader who provides strategic guidance and direction to advance the pursuit of high quality academic research activity within the College, leads improvements in the quality and impact of that research, and the growth of international and national research collaborations in line with the University strategic plan and College targets. As a key member of the College’s leadership team, the Dean (Research) plays a leading role in the development, delivery, maintenance and evaluation of all research activities and research higher degree programs within the College. contributing to the strategic management of the College. The role provides leadership in implementation of the University’s research policies and strategies within the College. In addition, it is expected that the Dean (Research) will work collaboratively with the Deputy Vice-Chancellor (Research), Vice-President and Executive Dean, senior staff in all Colleges, Professoriate, Research Program Directors, academic and administrative staff to ensure that the research endeavours of the College are managed in a manner that supports the achievement of high-quality research outcomes across the College. 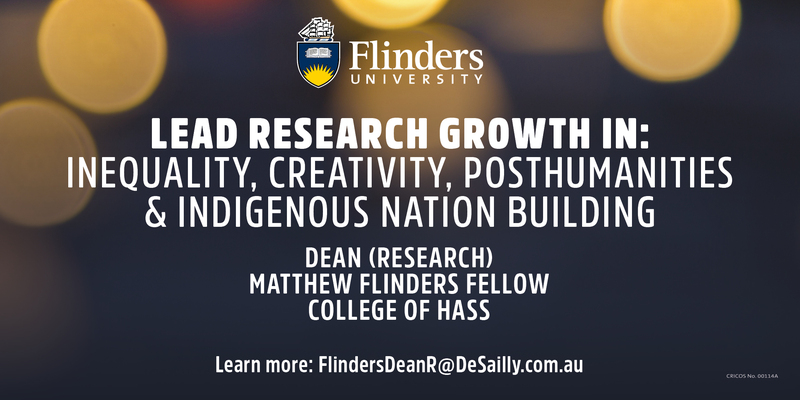 As a Matthew Flinders Fellow, the Dean Research would also be accountable for making a distinguished personal contribution to any of the following areas of research within the College of HASS: Performing and Creative Arts; Literature, Languages and Culture; Philosophy; Social Sciences; History, Archaeology and Indigenous Knowledge. Recruiting high calibre research higher degree students and postdoctoral fellows to their research. Performing innovative research with the potential to be highly cited and influential within their field. Sharpening the College’s research profile and building critical mass by strengthening existing research activities within their discipline area and/or creating new synergies with other discipline areas. Contributing at an international level to research and consultancy in their area of expertise. Scholars in the College of Humanities, Arts and Social Sciences are known for their innovative contribution to research outcomes that address some of the most pressing social problems of our time. Headquartered in Adelaide, Flinders University is charting a course to become an Australian top ten university, and amongst the top 1% in the world. Flinders’ bold vision, captured by the Strategic Plan Making a Difference — The 2025 Agenda, is to be internationally recognised as a world leader in research, an innovator in contemporary education, and the source of Australia’s most enterprising graduates. Flinders aims to help understand the world and to shape it for the better. Prospective candidates are encouraged to obtain the candidate brochure and for a confidential discussion early in the process. Names and contact details of three to five potential referees (these referees will not be contacted without the prior consent of the candidate).